The EPA is phasing out R-22 completely in 2020. 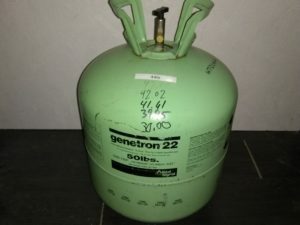 With the EPA phaseout of R-22 refrigerant, the price of the older refrigerant has skyrocketed in the last few years with supply dwindling, leaving many home and business owners with the stress of buying a new Air Conditioning Unit. If you have an older leaking system or need a major repair, you need to weigh the benefits of buying a new AC system now or Retrofitting your existing system to a new EPA approved Green Refrigerant. When performing a retrofit, an extensive leak search is done and leaks are repaired. Condenser and Evaporator coils are cleaned thoroughly. And a Compressor oil change is done if needed. New electronic controls are replaced and added. For instance, if your compressor dies, you are given an option on replacing with a new unit or converting your existing unit. Sometimes it makes sense to purchase a new unit, and other times it is more cost efficient to retrofit your existing Central Air Conditioning Unit. By converting the refrigerant of your existing air conditioner and making some adjustments, you can bring back original system performance and also possibly add efficiency. Do you like your current air conditioning system? Increase your 10 SEER unit up to a 13 SEER renewed unit. How? Perform a compressor oil change, recharge with fresh newer more efficient EPA approved green refrigerant such as R-407c, replace and add key electrical controls (such as a variable blower fan speed control to improve efficiency and help reduce humidity), leak check your system, replace filter/drier and bring back your unit. 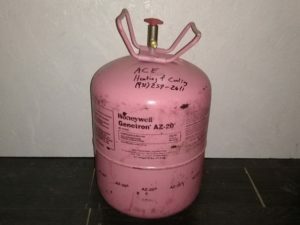 When a major repair is needed, such as a compressor change-out, and your older system is not in bad condition, it would make more sense to retrofit your central ac system to R-407C. Since the EPA phaseout in 2012, all new air conditioning units must have newer more Ozone friendly refrigerant, most commonly R410a. R-410a operates at high pressures not capable of working in older systems. 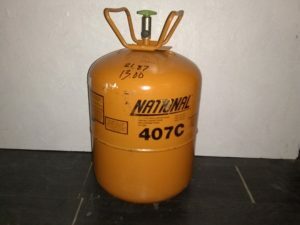 The problem with trying to Retrofit an older Central AC unit with R-410a is that it operates at much higher pressures, but is more ozone friendly. R-407c is also ozone friendly, meaning it has no chlorofluorocarbons that harm the ozone layer. What is included in a retrofit of your older AC unit? 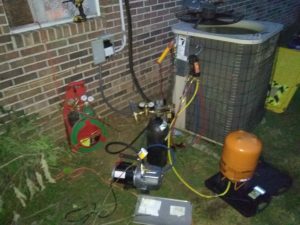 Recharge with fresh virgin refrigerant, replace filter/drier to remove moisture, replace contactor, capacitor, check and/or defrost board on heat pump units, add a variable blower fan control, new compressor oil, coil cleanings, leak search and repair. When choosing to do a retrofit, a NATE Certified Contractor is highly recommended because the task takes a certain skill set to perform correctly. Get multiple bids when considering a retrofit as many contractors simply would rather install a new unit. Installation technicians usually perform a new install. Unlike a retrofit, which requires an experienced highly skilled technician to do correctly. A successful Retrofit saving $4500 while adding additional efficiency. Incorrect duct work installations dramatically reduce efficiency. Many Installers do not perform an External Static Pressure Test, which is a “blood pressure test for you duct system,” when your system is installed. Having proper sizing of your duct work is critical. Enlarging your air return and adjusting your blower speed is the most remedy to improving your overall efficiency for your air flow issues. If adding a bonus room or addition you can add air returns, supply registers and electronic fan controls to achieve your air comfort needs without purchasing a new unit. Many HVAC systems are not setup to produce their potential heating and cooling BTU output. Consider going Ductless with a Ductless Mini Split for a very reasonable price. Mini splits are great for basements, bonus rooms, and any area you need additional heating or cooling, with features such as a remote control and high efficiency. Ductless Mini Splits can be more cost effective than adding a new unit. They come in multi zone systems with the capability of up to Five Zones (Areas of your home/ business). Retrofitting your Central Air Conditioning Unit, Save Money while adding efficiency to your older AC System. Retrofitting Duct work to increase inefficiency. Benefits of a Ductless Mini Split System.